…in which Bond helps his friend, Fidele Barbey, pilot a yacht to the Seychelle Islands, for business tycoon Milton Krest. Krest is determined to kill, capture, or buy as many rare species from the Island that he can and sell them to the Smithsonian. Arrogant and abusive to everyone – especially his wife whom he whips with a stringray tail he calls ‘The Corrector’ – Krest is murdered at night by an unknown assailant. Bond cleans up the crime scene, throws Krest overboard to the sharks, and reflects upon the morality of killing – feeling justified that Milton Krest got exactly what he deserved. Arrogant: a Prussian with pro-Nazi sympathies, Krest beckons his crew of German thugs – like dogs – with a silver whistle, and threatens to have Bond thrown overboard for lack of servility. Alcoholic: when sober, intolerable – when drunk, violent – Krest takes out his aggression on those around him. Filthy Rich: he earned his wealth – clawed his way to the top – so he deserves nothing but the very best. Collector: money buys everything, and everyone has a price – including his five wives. Krest buys, captures, or poisons rare species, and sells them for a tax write-off to the Smithsonian. 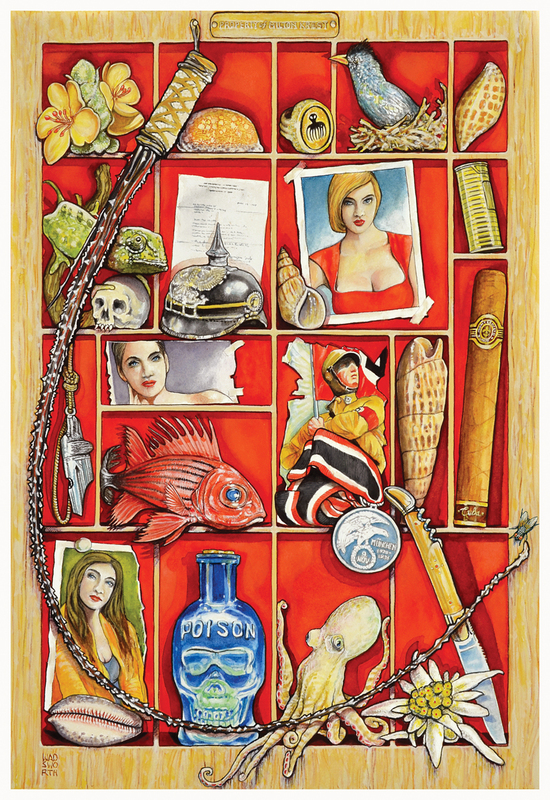 ‘The Corrector & The Collector – A Cabinet of Curiosities.’ © 2015 Gerald Wadsworth … in which we find the property of Hotel Magnate and Millionaire, Milton Krest. *The medal that appears is the NSDAP “Blood Order” for November 9, 1923; a commemoration to the Beer Hall Putsch in Munich. During March of 1934, Hitler authorized the “Honor Medal of November 9, 1923” also known as the Blood Order Medal (Der Blutorden) to commemorate the November 9, 1923 uprising of the National Socialist movement. What a fabulous piece of art this is! I’ve liked most of Wadsworth’s Bond work but with this one he’s really created something very beautiful. Thanks, David! It’s a Cabinet of Curiosities…property of Milton Krest…the bugger! I’ll be having prints made of it in the next week or so – I need to get a higher resolution scan made – and I’ll post availability and cost on my (kindly linked by Tom) website. I’m really pleased with the way it turned out and your comment is most appreciated. It was a real trial to figure out the imagery and make it all come together. Thanks for your support in the Bond Homage endeavour. David – I have had prints made and available…go to my website for email address and we can set up mailing. This one is my new favorite — definitely going to need to get a print of it! Superb! World-class! Yet another example of your tremendous influence on art! Fantastic imagery! I love how you pull key elements from the Bond novels and turn them into impressive works of art. I’m a huge fan. Gerry, this is not only an evocative image, it has led me to a new story. Your deep knowledge of the character shows in all your Bond paintings. Well, I’ll be “a grand slam redoubled in bastards.” Nice work, Mr. Wadsworth.